March 2017 has kicked off with a flurry of activity in both the disability and aged care sectors. 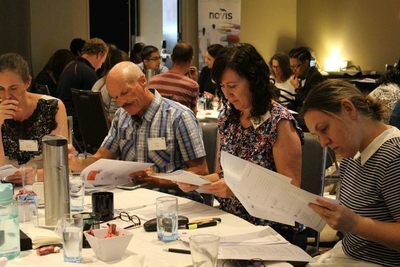 On 3 March MOD.A was contacted by the National Disability Insurance Agency (NDIA) about the release of three new documents related to home modifications now available on their website that are designed to give greater clarity to our sector on how to engage with NDIS participants. Details of these documents and where to find them are provided in this edition. MOD.A will continue to seek engagement with the NDIA about the outstanding issues of concern that our members have relayed to us over the past two years. On 27 February the new Increasing Choice in Home Care strategy was implemented, with all Home Care Packages (HCP) reverting now to rules that enhance consumer-direction. To the relief of the sector there was no significant system outages on the day, which had been a concern relayed directly to the Department of Health beforehand. Whilst the impact on the largely CHSP-funded home modification and home maintenance sectors are not immediate we can expect some flow-on effects and we, as a sector, should be marketing now more directly to consumers the benefits of home modifications and the capacity for funding them through their packages. More information on what is happening in aged care are included in the Aged Care Update section below. Alongside these changes in the sector MOD.A is working hard to progress its quality standard and in next month's newsletter we will feature how both the NDIA and the aged care sector are looking at quality and safeguarding and how our own standard will fit into these frameworks. How services handle complaints and inform their consumers of complaints and appeals processes will be part of the quality standard and this newsletter reports on a discussion I had with the Assistant Aged Care Complaints Commissioner in Canberra recently regarding this issue. Finally, we have been encouraged by the growth in our social media presence over the last few months and see it as a convenient way to engage with both consumers and providers alike. As we are always looking to promote member activities and achievements we encourage any member with an active Facebook account to send us their details so that we can Like your page and Share relevant posts with our expanding audience. I hope you enjoy this edition of the MOD.A newsletter. Members will be aware that from 27 February 2017 an important reform in aged care was implemented through My Aged Care (MAC). The new Increasing Choice in Home Care reforms are a significant step toward making the aged care system consumer-directed and impact particularly on consumers and providers of home care packages (HCP). Consumers exercising choice about who manages their HCP and how funds are allocated should now have a greater opportunity to identify home modifications as an option. Details of the reform can be found on the Department of Health website. Members are reminded that as of 1 January 2017 they are required to add details of client contributions to their DEX reporting. We have communicated to the Department our disappointment that this requirement was not initially part of the specs for the new reporting system and that not all providers have been made aware of this new requirement. However, this data, once aggregated, will be very useful for our sector. Not only will it indicate the quantum of funds received through client contributions but it will also demonstrate that this has always been a significant component of our service delivery and positively contrast our sector to some other services provided under CHSP. It will also be interesting to look at the state and regional variations in the amounts collected and to start developing an evidence base to back up what we know anecdotally - that for some people home modifications is simply not an option because they cannot afford the significant contribution that is required. As part of a drive to improve the quality and reliability of data into the future, the DEX system will be re-opened for organisations to enter service delivery data for the closed reporting period July-December 2016. This means that all users will have access to enter and correct their data, but only for a limited time from Wednesday 1 March - Friday 31 March 2017. Contact your grant agreement manager for more information and for guidance and training materials to take full advantage of this opportunity. Stage 2 of the DEX Client Survey project is expected to start in April. The survey will consist of a pre and post service componant and will be available as a 10 minute on-line questionnaire. Providers will be required to offer the survey to clients and facilitate access and completion. Participation in the survey by clients will be voluntary. More information and guidance materials will be made available to providers shortly. Providers can still participate in the Client Survey Pilot and contribute to the co-design phase. If you are interested email the Department of Social Services. A special training webinar session has been scheduled for Wednesday 15 March 2017, and all organisations participating in the pilot will be provided with training and guidance material. Alternatively, providers can still respond to the Client Survey Discussion Paper released in October 2016 to provide information about the survey itself. Comments on the approach to implementation and responses to the questions raised in the Paper are welcome via email until the close of the consultation period on 31 March 2017. More information is available from the DSS website. Western Australia's Home and Community Care (HACC) program will transfer to the Federal Government on 1 July 2018, completing the Commonwealth's takeover of entry-level aged care services for people over 65. 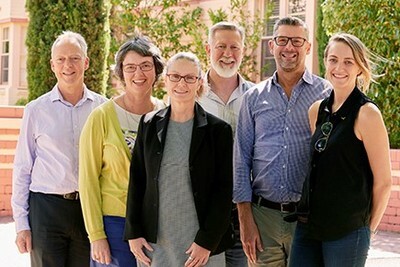 Responsibility for WA specialist disability services for older people will transition to the Australian Government from 1 July 2019. The WA and Commonwealth governments finalised an agreement on 31 January outlining the transition process. Under the agreement, the Commonwealth has guaranteed 12 months of funding to WA HACC providers from 1 July 2018 and there will be no requirement for a competitive tender process during this period. The state's HACC assessment services will also transition to the My Aged Care Regional Assessment Service from 1 July 2018. The Western Australian Government will continue to be responsible for HACC services for clients under the age of 65 or under 50 for Aboriginal and Torres Strait Islander people. Our CEO, Michael Bleasdale, met in Canberra recently with the Assistant Secretaries for the Home Care Branch and My Aged Care Operations of the Department of Health, Karen Pickering and Rachel Goddard, and other departmental staff, to discuss ongoing issues that home modification providers are experiencing with MAC. MOD.A continuously passes on specific issues to the department to help in identifying systemic problems and facilitate solutions, and this meeting was an opportunity to identify where improvements have been made and substantive problems that still remain. Members will recall the input of MOD.A and NSW Statewide in the Accelerated Design workshops at the end of 2016, and the outcome of this input can be viewed on the Accelerated Design Tracker on the Department's website. The problem, however, is that the solutions identified have not yet been implemented, and Michael was unable at the meeting to get any definitive timeframe for when this might occur. We encourage members to continue to inform us on issues they experience so that we can track them and advocate for solutions to be implemented sooner rather than later. Of particular concern to us would be any reports of consumers missing out on home modifications as a result of systemic MAC issues, or significant delays in delivering home modifications or other problems directly related to the operation of MAC. Please continue to correspond directly to Michael at ceo@moda.org.au. The Department informed Michael at the meeting that an updated CHSP Guidelines would be available some-time in March 2017. A Consumer Handbook has also been drafted by the Department, targeting consumers of CHSP services, and MOD.A has had the opportunity to provide feedback on behalf of members. We have no information at this stage as to its release date. The Department of Health has engaged consultants to undertake two projects of relevance to home-based services, both of which are due to be completed by June 2017. The Department has also contracted the Nous Group to review how the principles of wellness and reablement are being implemented within the home care services sector of aged care. This project will look at the progress the home care sector is making with embedding wellness and reablement approaches in its everyday service practice, with a view to developing an overarching change management strategy to inform the government on how to enable the continuing implementation of wellness and reablement approaches. The consultants aim to develop with consumers, providers and other sector stakeholders a maturity model approach to assist providers to self-assess their current stage of maturity and progress to higher stages of maturity in embedding wellness and reablement in their service delivery. The Nous Group have written directly to MOD.A to encourage the home modifications sector to participate in this research, and we are currently awaiting further communication to identify what opportunities exist for both MOD.A and provider organisations nationally to take part. More information and details of the Review are available here. The experience of our members operating under the NDIS in different regions has been varied thus far and included different processes in bidding for and completing this work. The publication of these three documents are welcomed as they provide a standard guidance for providers on the assessment and prescription of home modifications. The Guidance for Home Modifications Assessors provides more information about the role of Home Modification Assessors (HMA) and the level of competence they require. Their role includes providing information to participants, who will be given the choice of provider once their level of need has been assessed and the scope of the home modification agreed by the NDIA. Contracts for home modifications will be between participants and Building Works Project Managers (BWPMs) and will not include the NDIA. These BWPMs are encouraged to be engaged for complex home modifications and are required for work over the value of $30,000. The FAQs document addresses the different levels of home modifications available under the NDIS and identifies how participants are to obtain assessments and quotes and how to engage a builder/tradesperson. Complex Home Modifications (CHM) are identified as "required" through an AT needs assessment and a CHM Assessor is engaged to undertake a thorough assessment of the participant and their property in the context of their NDIS plan's goals. FAQ 5 provides details on what constitutes a suitably competent CHM assessor and references an OT qualification, a good understanding of the "scope and purpose of the NDIS" and at least one of a number of additional qualifications or accreditations, including being an Associate Member or above of the Association of Consultants in Access Australia. The final document is a template to be used during the assessment for a CMH. The requirement to develop the CMH assessment in consultation with a Building Construction Professional is a new development, as is the acceptance of a single quote for projects over the value of $10,000. Members who are interested to undertake modifications for the NDIA should read and familiarise themselves with these documents. If you have any questions or comments please contact us. The Aged Care Complaints Commission was established as an independent complaint's handling body in January 2016. Its recently released first annual report for the 2015-2016 financial year indicates an 11% increase in the reporting of complaints about aged care in Australia during its first six months of operation. The majority of complaints related to residential aged care with only 5% of complaints about Commonwealth Home Support Services delivered in the home. MOD.A has previously reported that CHSP (and HCP) funded home modifications do come under the jurisdiction of the Commission, and CEO Michael Bleasdale met at the end of February with the Assistant Commissioner, Shona Moloney, to discuss in more detail how complaints from consumers of home modifications should be handled. The Commission aims to resolve or facilitate resolution for complaints that it deals with, at all times encouraging parties to arrive at an agreed solution. Investigations are rare, but the Commission does have powers to make binding rulings where necessary and the Commissioner can initiate "own motion" investigations when complaints are occurring regularly or are being raised by particular consumer groups or in certain segments of the aged care sector. As well as complaints investigation the Commission has an important educative function, promoting a positive culture of complaints handling among services, which can operate as a crucial component of continual quality improvement. There is an expectation that service providers facilitate and as far as possible resolve issues that may arise with their consumers by having clear policies in place to manage complaints and by providing information to consumers on how those complaints may be resolved. Information should include how to contact external bodies, including the Commission, should complaints be unable to be resolved. The Commission provides a wide range of free resources to services to distribute to consumers and to assist services to handle complaints correctly. MOD.A's recent discussion with the Assistant Commissioner focused on the nature of complaints that may arise within home modifications in the future, including the need to refer some complaints on to other resolution bodies, such as Fair Trading NSW and the Queensland Building and Construction Commission (QBCC), which have a role in managing disputes between customers and builders and tradespeople. Complaints handling is an important part of service delivery and its emphasis will increase as consumer-directed care becomes the norm across all aspects of the aged care system. MOD.A's quality standard will address how effective complaints handling is an important aspect of delivering a quality, accredited home modifications service. Architecture & Access has launched Home Modification Victoria, a comprehensive service to deliver well designed and quality-built accessible homes for people wishing to maximise independence, safety and lifestyle through home modification. "Home Modification Victoria is a consumer-focussed service enabling people with disability, families and retirees to engage us directly to meet their needs for well designed and quality-built accessible homes," says Architecture & Access director Andrew Sanderson. "Our specialist home modification team has delivered more than 200 residential projects for insurance and private clients, earning us the reputation for specialist home modification knowledge, quality design and reliable delivery." "Many people are unsure about who to contact about taking the first step towards home modification," says Andrew. "The Home Modification Victoria enquiry line provides the important first port of call for people to speak to an experienced consultant who may explain the process of home modification and answer any questions." This initial enquiry service is part of the holistic approach taken by Home Modification Victoria, which covers in-home assessment through to design and construction. The Home Modification Victoria specialist team includes architects, designers, occupational therapists, building practitioners and project managers. Pictured from L-R: Architecture & Access Director Chris Porter, Helen Fearn-Wannan, Lisa Ham, Aaron Stowe, David Brown and Claire Oliver. Melbourne: 22 March 2017 at the Oaks on Collins, Melbourne. SOLD OUT! Adelaide: 5 April 2017 at the Stanford Plaza in Adelaide. Tickets still available here. Perth: 17 May 2017 at the Four Points by Sheraton in Perth. Tickets now on sale here. These workshops are presented by Liz Ainsworth, a well-respected and passionate Occupational Therapist with over 20 years' experience working in the home modification sector and co-author of An Occupational Therapist's Guide to Home Modification Practice. OT and builder participants at the Brisbane and Sydney (Parramatta) workshops have provided some very useful and informative insights on how effective communication and collaboration between the two professions can overcome many of the challenges with home modifications. Overall feedback from both workshops so far has been extremely positive with 98% of respondents recommending the workshop to their colleagues. 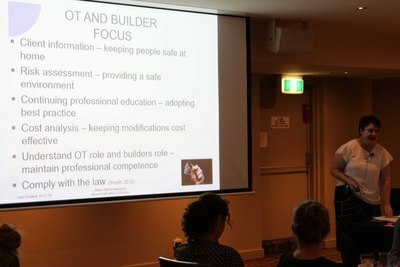 Images from the AGA Home Modifications workshop in Parramatta, 15 February 2017: Presenter Liz Ainsworth reinforces the importance of the OT-Builder relationship; delegates ponder a case study; delegates engaged in group discussion. The Government has released the Review of the Disability (Access to Premises Buildings) Standards 2010 (Premises Standards) Report and its Response to the Report. The Government response sets out reforms to be made to the Premises Standards to improve their effectiveness and clarity, as well as new measures to assist with their application and evaluation by government and industry. The Premises Standards Review Report and the Government's response to the Report can be accessed at the Department of Industry, Innovation and Science website. A joint media release from the Minister for Industry, Innovation and Science, Senator the Hon Arthur Sinodinos AO, and the Assistant Minister for Industry, Innovation and Science, the Hon Craig Laundy MP, can be accessed here. The NSW Government has worked with Bunnings to announce the roll out of the Healthy Homes pilot program. The program includes D.I.Y. workshops aimed at helping older Australians better equip their homes to support their independence as they age. Minister for Ageing, Tanya Davies, attended the Healthy Homes pilot launch at Bunnings Alexandria on Thursday 2 March. "The Government consulted with older people from across the state last year. What we learnt was that while many older people want to stay in their own home for as long as possible, they are less confident they will be able to do so because their homes may not meet their physical and mobility needs," Mrs Davies said. "Healthy Homes will assist older people to understand the possibilities for adapting their homes as their needs change. It will empower older Australians to make improvements in and around their homes so they are able to live independently for longer." The pilot program will begin this April with workshops to be held at Bunnings Alexandria, Kingsgrove, Bankstown and Lidcombe stores, before being rolled out across Bunnings stores state-wide in 2018. Bunnings Chief Operating Officer, Clive Duncan said Bunnings was pleased to offer the Healthy Homes program to seniors. "Our team members can help with practical advice on products and home improvement projects and we also have a range of how to guides and videos on our website. There are many simple and low cost ways to make homes more comfortable and suitable for ageing residents, including improved safety and security, insulation and energy efficiency, home automation and assisted living," said Mr Duncan. "Healthy Homes and the NSW Seniors Festival are key deliverables of the NSW Ageing Strategy, and demonstrate the commitment of the NSW Government and FACS to working in partnership with community groups and the private sector to achieve better outcomes for older people in our communities," Minister Davies said. Support materials are available from the Department of Health website to help with both system and process enquiries following the launch of the Reforms on 27 February 2017. Consumers and provider fact sheets can be found here. Quick reference guides and system support materials can be found here. Ewing Industries, leaders in accessible tapware, are one of many companies that have started to develop products that benefit people with dementia and other cognitive conditions. 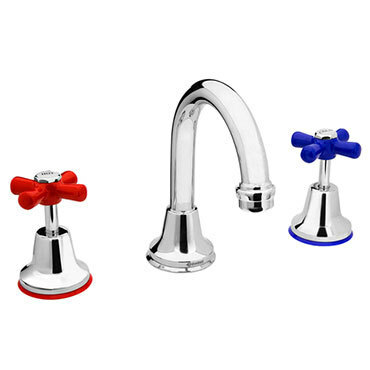 Their ESEE Tapware range have high contrast red and blue handles with hot and cold indicator buttons and red and blue Flange Dress Rings. This range of tapware is easy to use and maintain, and are not only suitable for clients with cognitive issues but also those with low vision, limited grip strength and children learning to use tapware. ESEE Tapware: Product THME31 ESEE Basin Set, WELS 5 Star rated. Quoss Reno Transformer series offers a range of products that can do away with many of the problems related to updating old plumbing fixtures. You can now replace any old 2 taps to an easy-to-use, maintenance-free flick mixer, quickly and affordably. Quoss products can be installed within 30 minutes without breaking the walls, damaging the tiles, or drilling any holes. No plumbing or piping is needed, and once installed there won't be any on-going maintenance as it prevents leaks permanently. Moreover, the Quoss system is interchangeable, so renters can take it with them when they move out, without leaving any marks or traces. For more information and to view their full range of shower, bath, kitchen, laundry, and basin products, visit www.quoss.com.au. 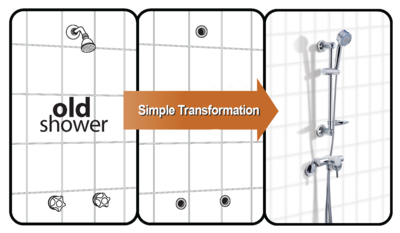 Quoss Reno Transformer: Transform old 2 taps into a flickmixer without breaking walls in 20 minutes. Do you know of other new or innovative products for the home modification sector? Let us know by email for inclusion in future newsletters. At Allianz Global Assistance, we offer a wide range of specialised aids and appliances that support a more healthy and active lifestyle. Our extensive product range and in-depth knowledge of movement aids in improving mobility helps meet ongoing health and home care needs. We have a product range that includes over 350 mobility aids and appliances and will help you find the best equipment for your personal situation or health concerns. Our offering includes an easy online ordering system with Australia-wide access, fast turnaround for delivery of products, extensive product knowledge and empathetic customer support. With Allianz Global Assistance, we provide help the whole way. Aged Care Workforce Growth Strategies Conference. Rydges, Melbourne, 21-23 March 2017. Human Rights and Social Justice National Conference: Shifting Client Control. Crowne Plaza, Surfers Paradise, 23-24 March 2017. Strengthening Dementia Strategy Conference. Radisson Blu Plaza Hotel, Sydney, 30-31 March 2017. AGA Home Modification Workshop. Four Points by Sheraton, Perth, 17 May 2017. Active Ageing Conference 2017. Bayview Eden, Melbourne, 30 August 2017. The Health of Housing: The Design, Planning and Politics of How and Where We Live. University of the West of England, Bristol, UK. 25-26 January 2018.